A friend of mine billed Source Code as ‘The Matrix meets Minority Report.’ While this may be a tad broad, it is not an entirely inaccurate explanation of Source Code. Although a Sci-fi film at its core, Source Code is more enjoyable to the general public than many other titles in its genre and will leave one thinking afterwards too. Source Code is about sending someone into a computer-regeneration of a specific incident in the past in order to find out (useful) information. Throughout the movie, Colter Stevens (Jake Gyllenhaal – Rendition, Brothers, Nocturnal Animals), a US soldier in a helicopter unit, is constantly sent into the Source Code for an eight-minute stint. Each time, Colter finds himself on a train sitting opposite the cute-looking Christina (Michelle Monaghan – Mission Impossible III, Eagle Eye, Due Date); and at the end of the eight minutes, the train blows up. Himself included. Earlier, a bomb went off on a train in Chicago and it is rumoured that another one will go off in the middle of the same city later that day. Colter’s task is to find the bomb and discover information about the bomber. 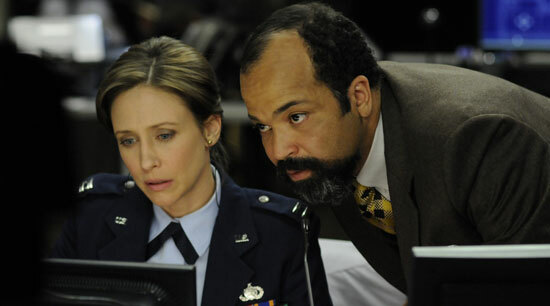 His superiors, the pretty Captain Colleen Goodwin (Vera Farmiga – The Boy in the Striped Pyjamas, Up in the Air, The Judge) and Dr. Rutledge (Jeffrey Wright – Casino Royale, W., The Ides of March) believe that the information could be crucial in deterring the next attack. Yet, after going into the Source Code a few times, Colter’s motives change. He intends not only to complete his mission; but also to save the passengers on the train and ask out Christina. 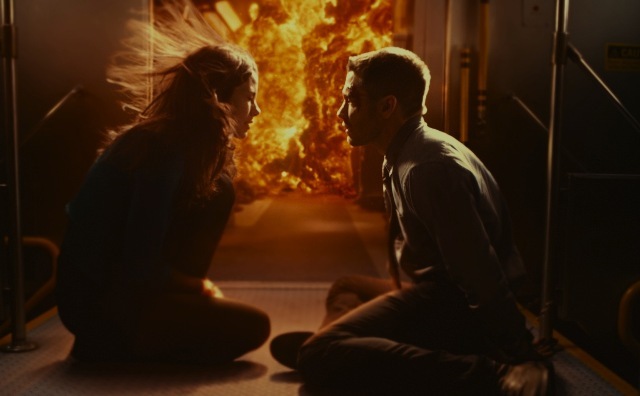 Source Code’s plot has numerous holes that one can pick at without difficulty. It can also feel quite repetitive at times. 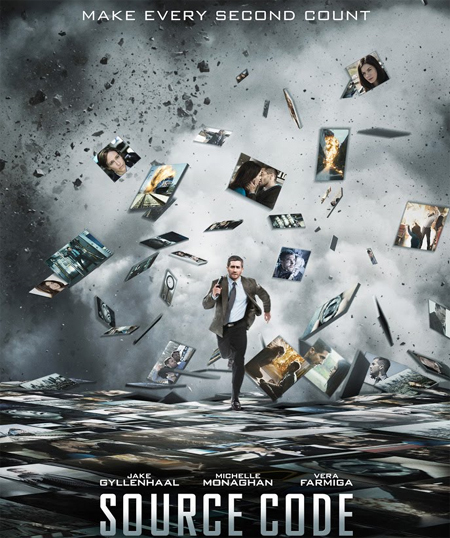 The director, Duncan Jones (Moon), a relative novice to the industry, puts forward some interesting ideas that bring to mind tenuous comparisons to The Matrix for de facto teleporting someone into a computer-generated world; and Minority Report for preventing an incident from occurring by using highly futuristic and technologically advanced methods. Yet, Jones also leaves several aspects of the plot with a lot of explaining to do; most notably the paradox of time-travelling and the ending. One thing, however, that works in Source Code’s favour is that it does not descend into a mushy love-story like so many other films. The dialogue is not bad either and there are humorous moments too. Again, Jones fails to explain the quantum physics behind the invention of the Source Code; but, speculatively-speaking, he has done this deliberately knowing that the majority of the film’s viewers will neither understand nor be interested in such terminology. Captain Colleen Goodwin and Dr. Rutledge urging Colter to go back into the Source Code so as to unearth more information about the bomb and the bomber. That Jake Gyllenhaul plays well as the main character gives the movie the credence the plot lacks. He is not given a particularly challenging role, but he still performs decently enough. The same can be said for the other members of the cast. Michelle Monaghan, Vera Farmiga and Jeffrey Wright may act competently; however, they are not given enough screen-time for their characters to be anything other than two-dimensional. Alike the acting, the choreography is fine. For a movie that is cyclic and teleports the main character suddenly and regularly, it does not feel overly jerky to watch. This takes some skill and credit must go to Jones for this. All-in-all, Source Code is a surprisingly entertaining film. It has a decent cast, some good jokes and clever ideas. Nevertheless, the storyline is deeply flawed and the ending rubber-stamps it. Ironically though, the film’s very flaws are what will keep viewers thinking long after the film finishes.